SL-Belt Width: Select One1.5" Standard Width1"2"
The 'Orion' Custom Leather OWB Handgun Holster by Soteria Leather is a gun belt holster with a minimalist design. The Orion outside the waistband gun holster is constructed of leather from American cattle. 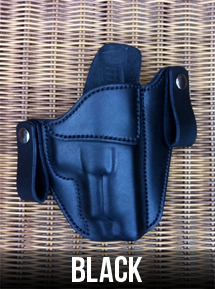 The Orion custom concealed gun holster is made in the USA. 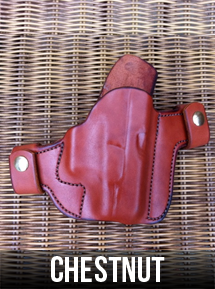 Two belt slots located on this holster, one to the side and one directly behind the gun. 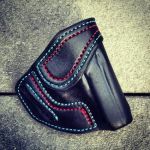 It's is easy to make this 'your' custom concealed carry holster. See your options below. NOTE: The "Basketweave Finish", must be ordered separately. See link below. This concealed carry holster will fit a 1-1/2" gun belt. If you need 1 '' or 2" belt slots, see the options. 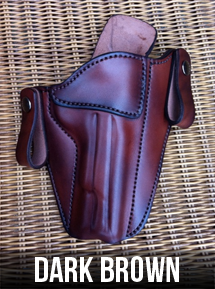 Your custom-made OWB gun holster will ship eight to eleven weeks. The Name: Orion was a giant and hunter in Greek Mythology. This concealed carry holster is available for the following weapons. Springfield XDM Full Size 9, XDM Full Size 40, XDM 3.8"